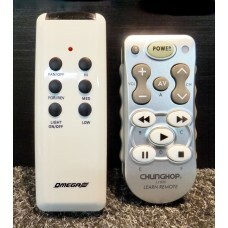 Omega Ceiling Fan Remote Control Replacement Version V5 (original pictured on the Left, our replacement pictured on the right). 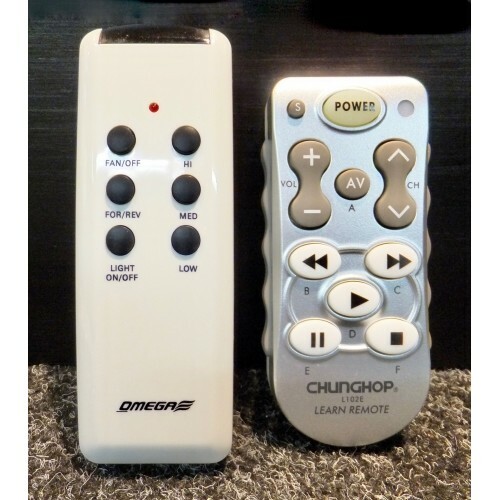 You will receive our quality replacement remote control (pictured on the right), it is programmed exclusively to suit Omega Ceiling Fans has all of the same functions as the original Omega remote. 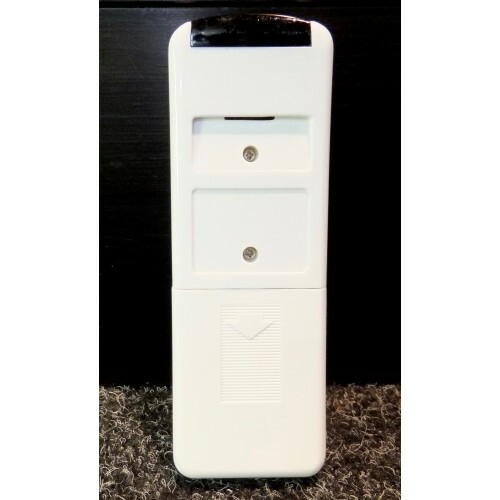 Unlike the your original Omega remote control, our replacement remote control is guaranteed not to fail and will last for years and years, that's why it comes with a 5 year free replacement warranty! 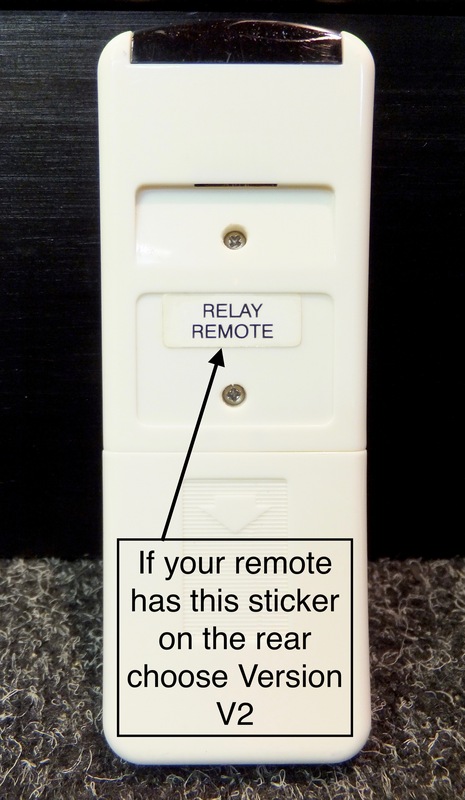 Should you have any problem with our remote, providing it has not been damaged in any way or been opened (other than the battery compartment) or had leaky or incorrectly installed batteries, simply return it and we will replace it free of charge! (excluding return postage cost). NOTE: REGARDLESS OF THE MODEL NAME OF YOUR CEILING FAN, WHEN ORDERING PLEASE SELECT THE VERSION WHICH HAS THE SAME REMOTE PICTURED AS YOUR ORIGINAL, THAT IS IF YOUR ORIGINAL HAS A DISPLAY SCREEN ORDER VERSION V1, IF NO DISPLAY SCREEN ON YOUR ORIGINAL ORDER VERSION V2, V3, V4, V5 or V7 BUT PICK THE ONE THAT IS EXACTLY THE SAME IN OUR PICTURE AS YOURS! VERSIONS V1, V2, V3, V4, V5 and V7 ARE NOT COMPATIBLE WITH EACH OTHER! 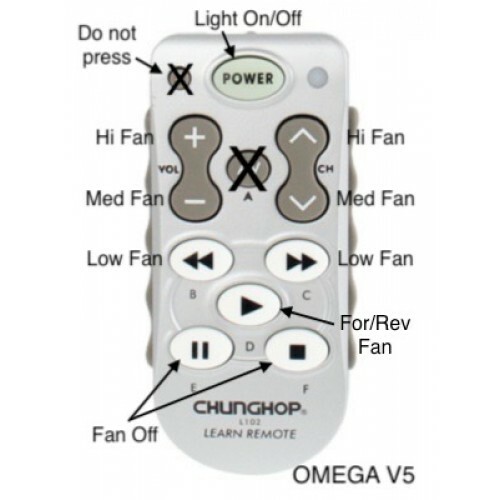 ALSO NOTE: THIS V5 VERSION IS NOT COMPATIBLE WITH THE OMEGA REMOTE THAT LOOKS THE SAME BUT HAS A LIGHT DIMMER BUTTON AND 3 to 5 DIP SWITCHES IN THE BATTERY COMPARTMENT (see picture below) WE DO NOT HAVE A REPLACEMENT AT THIS STAGE FOR THAT REMOTE, HOWEVER WE CAN REPAIR YOUR ORIGINAL REMOTE. CLICK ON LINK BELOW FOR REMOTE CONTROL REPAIR SERVICE. NOTE: THE S BUTTON IS A PROGRAMMING BUTTON AND SHOULD NOT BE PRESSED! Takes 2x AAA batteries (not included). Omega Ceiling Fan Remote Control Replacement Version V1 (original pictured on the Left, our replacem..
Omega Ceiling Fan Remote Control Replacement Version V2 (original pictured on the Left, our replacem..
Omega Ceiling Fan Remote Control Replacement Version V7 (original pictured on the Left, our replacem..
Omega Ceiling Fan Remote Control Replacement Version V3 (original pictured on the Left, our replacem..
Omega Ceiling Fan Remote Control Replacement Version V4 (original pictured on the Left, our replacem..
Casablanca Ceiling Fan Remote Control Replacement Version V3 (original pictured on the Left, our rep..